Darma Valley trek, relatively an unexplored trek, is known for offering mesmerizing scenic beauty. 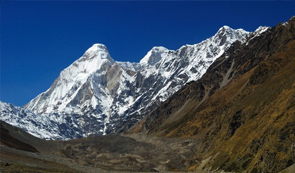 More or less, Darma Valley trek and Panchachuli Base Camp Trek follows the same route, the only difference is that trekkers are going to explore the vicinity of Darma Valley more deeply. Trekking to Darma Valley can be little strenuous though it may be easily trekked with sensible trekking techniques. The trek commences from Sobla, the entry point of the Darma valley. Trail moves further to Duktu through Dar, Sela, Baling and Baling. Duktu along with Dantu, two remote villages, are a part of the Darma Valley. Also, the valley is inhabited by 12 villages with population of less than 1000 people. Relax on the green flower-strewn meadows of Duktu and relish the view of the Panch Chulli peaks. The trail from Duktu becomes a bit strenuous as one head towards the east face of Panch Chulli by crossing glaciers and continued to trek towards Bungling. Cuddled between Lassar Yankti Valley and Kuthi Yangti Valley, Darma Valley offers the breathtaking view of Panch Chulli peaks. The valley is also known for the flora dotted in the region. Pious for some and adventurous for other, Darma Valley also holds a strong religious connection. According to the historians, Pandavas (central characters of Mahabharat) cooked their last meal on the five peaks of Panch Chuli Massif before leaving for heaven. The itinerary mentioned in next tab, will tell you how to prepare for trekking trip and provides day-by-day route description of this thrilling trek. More or less Darma Valley route follows the same as the Panchachuli Base Camp Trek, but the best part of this trek is that trekkers will explore Darma Valley more deeply. The trek passes through flower-strewn meadows, water streams, and ancient towns, which makes it an absolute delight for the trekkers. The weather best suits for Darma Valley trek during mid-April to June as the temperature is pleasing and monsoon yet remains to start blocking the route with landslides. Mid-September to late October is also the best time to trek to Darma Valley. Summer: Summer months mid-March till mid-June is the best time to trek to Darma Valley. The sun warms up the cool region of Darma Valley and trekkers find it easy to cope with the environment. Monsoon: During monsoon season, the route gets slippery and trekkers find it very difficult to make through the route. Spring: Mid-September to late October, the charming spring favors trekkers to make way to Darma Valley. Pleasing sun and calm weather. Winter: season starting from November till late February, the temperature falls significantly low and thus tourists cannot trek in Darma Valley. Where is the Darma Valley ? Darma Valley is situated in the Pithoragarh District of the Kumaon division, Uttarakhand. The valley came into being because of the Darma River. Darma Valley is sandwiched between two other valleys in the Himalayas – Kuthi Yangti Valley (to the east) and Lassar Yangti Valley (to the west). 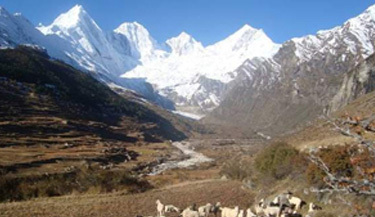 Gangachal Dhura connects Darma Valley with Lassar Valley, while Sinla Pass and Nama Pass link the Darma Valley with Kuthi Yangti. Darma Valley begins at the Sino-Indian border near the Dawe Village and extends up to South. The place has magnificent flora, which includes wild flowers especially the lovely orchids which are found over here in huge numbers. Alpine meadows, thick forests, waterfalls and streams weave a web of magic in the entire valley. There are around 12 villages with a meager population of less than 1,000 people. Primary occupations of people are livestock rearing, trading and farming (common crops - buckwheat and potatoes). The land meant for cultivation has been reduced by 25% from its former size after the migration of 1970s, boosting the biodiversity of the valley. By Bus: Dharcula, the nearest town to Darma Valley, is well-connected with major regions of Uttarakhand through motorable roads. By Air: Nearest airport is Pantnagar which receives regular flights from Delhi. Take an AC Train for Kathgodam from Old Delhi railway station at 2245 hrs and reach Kathgodam early next morning at 0600 hrs. Overnight journey. After you arrive at Kathgodam railway station, we will drive towards Almora a 4 hour run. After reaching in the evening you can visit the market for the shopping or stay in the Hotel and relax. After having breakfast we will drive for around 206 kilometres which will take about (8 hours) to reach Dharchula through the scenic Kumaoun valley. Then we will cross Jouljibi; At Jouljibi there is the convergence of the River Gori with river Kali that crosses into India from Nepal at Dharchula. The trek now moves northwards, passing Dharchula and Tawa Ghat and then diverts to westward direction into a gorge following the Dhauli Ganga River till Sobla. Sobla is about (1670 metres) and is the entrance point to the Darma Valley and is the point from where our trek starts. Our destination is Dar Village (2134 metres) which is 5 kilometres. From Sobla we pitch up here for the night. Today's the hike is very long, but not an easy one. The trek from the Dar to Sela goes ahead through hillsides of the lush green pastoral fields. The campsite is located on the periphery of Sela. 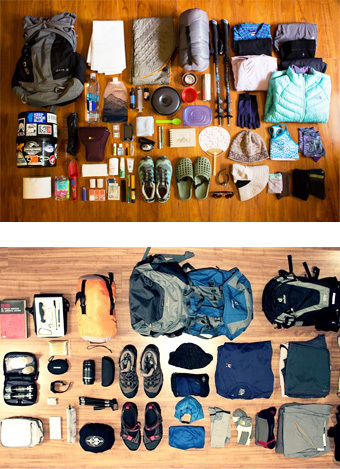 It is a comparatively much easier day as the trek today is simple and trouble free. The trail to Baling moves from the up and down hillsides, but the altitude gained is quite moderate. 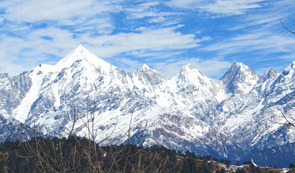 From here you can get the stunning views of the far-away glaciers and the excitement to move ahead in the trek is high. However, we will camp here for the night. 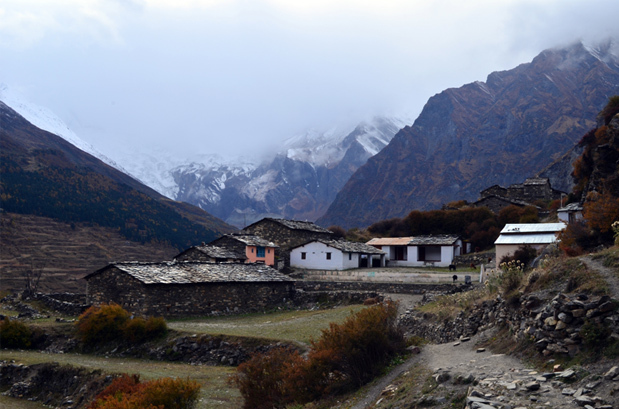 Duktu and Dantu are the two neighbouring villages which are the last centres of human habitation in this region of the Darma valley. From here the views of the Panchachuli peaks are just spectacular. 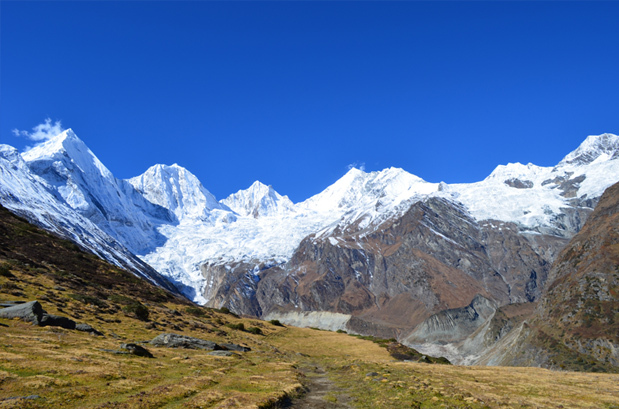 For viewing the stunning Panchachuli glacier there is an extensive meadow on the outskirts of Duktu that offers a perfect setting with the fabulous backdrop of the soaring Panchachuli peaks. This spot is the perfect place to get some incredible clicks as this place is picture perfect. We will stay at this destination for the night. Today is a momentous and exhilarating day, when we will today depart from our base camp at Duktu to explore the stunning Panchachuli glacier. The glacier projects towards the outside from the East face of the Panchachuli and a 4 kilometres trek from the camp site beside the Yuli River leads towards the massive and magnificent glacier itself. The spot itself offers an incredible panorama outlook of an expansive meadow encircled by the tall oak and birch trees with the Panchachuli (6904 metres /22652 feet.) intimidating in the background. Today we will commence on return trek. The trail from Duktu to Nagling is a steady descent and the days' hike will take around 5 hours to reach the Nagling. Day Nine is the last day of our walk. By noon we will reach at Bungling. From here after a having a rest for some time, we get on to a jeep that will drive us back to Dharchulla. Today, we get on a motor vehicle that drives us back to Mukteswar. Here we will check in for the night at the Trisul orchards. Mukteswar is a stunning place and is famous for its incredible views of the magnificent Himalaya. Today is a day when we can relax and unwind. In the late afternoon we board a vehicle that will drive us back to Kathgodam. The train from Kathgodam to Delhi departs at 08.40 PM. Overnight train journey. When to book Darma Valley ? You should book Darma Valley trek two months in advance so that you get ample amount of time to prepare well for the trek. Our pick up and drop point for Darma Valley trek is Old Delhi train station. We will send you the train ticket and you can board train from there to Kathgodam. At Kathgodam our guide will pick you from train station and then from there your tour will start. We always have a trek leader who leads the trek from the front. What is minimum age required for Darma Valley ? The Darma Valley trek is a moderate trek with a maximum altitude of 3470 mts/11390 ft minimum age required is 15 years. What will be the minimum temperature during Darma Valley ? In the month of April to June and September to November the temperature during the trek can go as low as 10 Degree Celsius during the night, In the month of December to March the temperature in minus. July and August is rainy season. How long we trek during Darma Valley ? We plan our treks in such a way that after 6 hours of trekking we reach next camp around lunch time and normally trek a distance of 10 to 12 Kms.